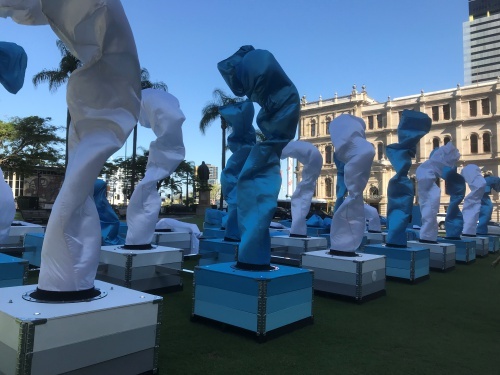 It is one of 15 ‘Curiocities’ that have been assembled as part of a trail of interactive installations along the Brisbane River, between the South Bank Cultural Precinct and Brisbane Powerhouse. unique science installation came from the earth’s sky and the unpredictability of the weather. “I think we all sometimes wish we had control over the weather – there are days when it’s too hot, too cold, too dry, not enough rain, and the list goes on,” Mr Drake-Brockman said. Treasury Brisbane is part of The Star Entertainment Group, the lead partner in Destination Brisbane Consortium, which is building the $3.6 billion Queen’s Wharf Brisbane integrated resort in the CBD. “We are proud to add this inaugural Curiocity Brisbane event to the long list of cultural, music, sporting, and community initiatives that we support across South East Queensland (SEQ),” said The Star Entertainment Group Managing Director Queensland Geoff Hogg. “From the Brisbane Festival to the TV Week Logies and the Magic Millions on the Gold Coast, supporting major events helps us to build partnerships with industry and the community to showcase what is unique and special about SEQ. “We hope Curiocity Brisbane will spark the imagination of locals and visitors and get them to be more curious about our beautiful river city. In fact, locals and visitors who are curious about Queen’s Wharf Brisbane and what it will contain can download the CuriocityAR app for a sneak peek. From the opposite side of the river, the app can be used on mobile phones to scan markers in position at South Bank to achieve an augmented reality experience of the integrated resort. “The area where our consortium is building Queen’s Wharf Brisbane is the birthplace of Brisbane – it is where the first European convicts settled when they came here,” Mr Hogg said. In addition to the ‘Curiocities’, Curiocity Brisbane also includes the World Science Festival Brisbane (from 2024 March), and a brand-new global technology and innovation event called QODE (from 2-3 April). Curiocity Brisbane is supported by the Queensland Government through Tourism and Events Queensland and features on the It’s Live! in Queensland events calendar, worth $800m to the state’s economy in 2019.